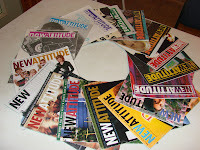 In 1993, the premiere issue of the New Attitude Magazine arrived at our house where my oldest brother, then 13 years old, received and read it. Seth continued to get the magazine for the next 4 years until they ceased publication. Now, ten years later, he passed all of the magazines down to me. Only having heard about them, I was eager to read them. Picking up the first issue and going from there, I read them all in less than a week. They were great! From the editorials to the articles sent in by readers, it was all wonderful reading. Though written many years ago, so much of it is still applicable today. Seth was a young teenager at the time of Joshua Harris's first outreach to teenagers. I was 14 when Brett and Alex Harris started The Rebelution. Seth and I are similar in a lot of ways, so I always thought this was rather neat. I was thrilled to see other teenagers close to my age standing up and standing out for what they believe and I know that Seth was too, at the time. I've been a part of The Rebelution since I first found out about it from Anna. Reading their motto for the first time, I thought, "Yes! This is what I want to do. I want to rebel against these low expectations!" They were putting into words what I had been feeling and trying to express. So, let us step out of out comfort zones and Do Hard Things! Great post! I first started hearing about Joshua Harris on Acquire the Fire on TBN and various Christian message boards somewhere between 1999-2001. My Daddy bought me "I Kissed Dating Goodbye" in 2001 and I enjoyed it. I found he put into words a lot of what my Parents had taught me and I had thought. When I came across the Rebelution last year I was thrilled because even at twenty (now 21) I can relate like you said "they put into words what I had felt" when I was a teen and even now! Although I believe I came across their site once or twice before, I thank You and Anna for my interest in the site! The more I read your posts about The Rebelution, the more I started visiting their site, so thank you! Great post! I agree - The Rebelution puts into words what I feel and wish to express. It's such a blessing! I don't think Miriam ever got the New Attitude Magazine, but she's gone to a few of the conferences. She's going again this year, and this time I'm finally old enough to go along! Wish you could come as well. Oh Joshua Harris. If you wanted to get students at my college (Christian Church/Church of Christ) riled up, you would mention Joshua Harris or the Left Behind Series. If we really didn't want to hear a lecture in class, someone would sneakly (real word?) some how mention one of those two things in class and then we would get to hear awesome tirades from our professors on the evils of both. A post from Miriam....yeah! I quite agree with everything you said!